My Nextbook Next3 review unit finally arrived a couple of weeks ago so I’ve been thoroughly testing it and experimenting with different apps trying to figure out how the Next3 stands up against the competition. So far I’ve been fairly impressed with the device given its 8.4″ screen, Android 2.1 operating system, and sub-$200 price, but that’s not the whole story. Head on over to the new Next3 review page for the full rundown and video review. Additionally, I just posted a new NextBook page with descriptions of the forthcoming Next4, Next5, and Next6 that are coming out within the next few months, along with the two NextBooks currently available. The link for the new NextBook page is in the main navigation to the left for future reference. Hi Nathan! I really liked your review of the Next3. I have an eLocity A7 now, but, I still miss my Next3. I wanted to tell you that HSN is selling a 7″ screened tablet under the Next2 name running Android 2.1. They said it was an update to the Next2. It started selling in January ’11. I did move apps to my SD card with the Next3, but, I can’t remember how I did it. I was able to download attachments from my e-mail to my SD card using an app called “Blackmoon AttachSave Lite”. Also, I found the parent company of eFun’s website, it’s name escapes me at the moment. On the website it indicated that the Next5 and 6 harware is capable of running Android 2.2 and bluetooth. All the official information I could find said the tablets would have Android 2.1 and didn’t say anything about Bluetooth. So, there might be updates available eventually, (wouldn’t count on it). Or, they might be saving Android 2.2 for new models, (much more likely), Next 7 and 8 anyone? There are some stores that are selling the Next2 with Android 1.5. JR.com and WalMart.com are two of them. HSN had them first. They’ve moved on to the 2.1 version. The official specs for the five and six said Android 2.1, just like you posted. The parent companies website said they could make those tablets with Android 2.2, but, they won’t be offering them like that now. I found this because I was looking for an extra power adapter. Yifang was the name on the one that came with the tablet. One of the pictures I saw showed a Next5 with what looked like a receptor in the right side of the tablet. I can’t find that picture now. I also read that the Next6 will have 4GB of memory. The Next2 only has two. I just purchased a Nextbook 3 on ebay. I am wondering if you think that this one can be made into an Android honeycomb the same way the Nook Color does? I was looking at the Nook Color, but when I saw your review of the Nextbook 3, it looked like it would suit my needs fine, and I thought that hacking the Nook would be difficult for me. OH, well, a day late, but I still purchased the Nextbook 3 for $100 less than I would have paid for the Nook Color. I love your info blog, you do a great job! In theory I think it can run Honeycomb. 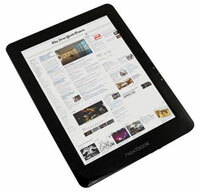 Google said that some of the budget tablets that are currently on the market would be able to. However, it does require someone that really knows what they are doing to be able to get it to work. The Nook has a very active hacking community and they are constantly pushing the envelope. So it will all depend on if someone decides to create a ROM or hack that will work on the Next3. i cant decide which ebook reader i should get for my mother, im tossing up between the next3,pocketbook iq and the Pandigital Novel 9″. which one do you suggest i get? That’s a tough decision but I would personally choose the Next3 because I like the screen size the best and it plays video the smoothest of the three. It seems to work with more apps too, Aldiko 2.0 and the Nook reading apps both work on it. One thing I don’t like is the power management isn’t as good as the Pandigitals. If you put it in Standby the battery drains too fast so you always need to power it off when not using it. ok thanks for the help, i also saw the cruz reader do u think its better then the next3? No. The Cruz isn’t better than anything. Steer clear from it. awesome 🙂 do you know of any sites that sell the next book and ship internationally? Not positive on international shipping, but you may be able to find one via eBay. I think B&H might sell internationally and they have the Next3 and Next2 now. Do you know when the Next4 is going to be released? I am waiting for it!!! No word yet but I’ll keep you updated. I don’t think it can be updated. They created a new model, the Next 6, which is essentially an updated version of the Next2 with Android 2.1 and a capacitive touchscreen. So, which one do you think is better? The Next3 or the Next6? I was also looking at the Pandigital Novel. From your experience which do you think is better between that and the Nextbooks? All are very similar. I like the screen size of the Next3 better than the Next6, but both are very comparable otherwise, the main difference with the Next6 is it has a capacitive screen instead of resistive, so it should be more responsive (haven’t tried it to know for sure). The Pandigital Novels are pretty comparable to the NextBooks. It depends on what model you get. Make sure it isn’t the old one with Android 1.5. The newer ones have 2.0. The NextBooks have 2.1, which is a little better, and offers support for my favorite ereading app, Aldiko 2.0. The Pandigitals are probably a little more stable. I say that because my Next3’s battery drains if I leave it in standby for very long, but my Pandigital can stay in standby for 2 weeks without hardly draining the battery at all. Thanks for your help. I have been researching e-reader/Fairly Inexpensive tablets for a while and want to find something that will last. I did the same thing with my Mp3 player and I have had that since 2005 and I use it every day. I love your website and it has be great exposing me to different E-reader/Tablets. I do have one last question, between the pandigital 7″ white, 9″ Pandigital and the next3 which one plays video stored on local memory and videos from your tube better? The NextBooks play video better, relatively smooth. All the Pandigitals lag somewhat with video playback for some reason. Great. Thanks for your help. Again your website has been very helpful. My daughter has been wanting to have an e-book reader where she can read her mangas anywhere she wants. The Next3 is I think a good suggestion. I see it has all the features that a good ebook reader should have. Thanks for the review. Hello. I ended up getting a Nextbook3. I love it but I have had a few issues. The first one I got crapped out in the first night so we got a replacement from Walmart.com. The second one lasted about 25 days before I got this error;” The Process android.process.acore has stopped unexpectedly. Please try again” I talked to E-fun and they said that there is nothing I can do but send it to them and they send me a new one. They also said that this is common among android tablets and phones. In your experience have you seen this error often or at all? I am starting to think about getting my money back from Walmart.com and get a pandigital or Nook. Doing a search on Google, that does seem to be a problem with some Android devices. I don’t know what it means, but it is weird that you happened to bring that up just now because I’ve started getting that same exact error with the Notion Ink Adam. It is really annoying. Apparently doing a factory reset fixes it with some devices, but I haven’t tried that yet. That is weird. I would have tried the factory restore but I could get past the error to get to the settings to do the factory restore. Let me know if you come up with a solution for future reference. Thanks. Ok something weird with the Nextbook Next3. I just had Walmart.com send me another one after the last one I got had the ” The Process android.process.acore has stopped unexpectedly. Please try again” pop up and I couldn’t get past it. The last one came with the ANDAPP store but this one came with the Slideme App store. Have you heard of any of them coming with a different app store? Is this possibly a newer version? Also, do you know if a 16 gb card will work on the Next3 or does it only use the first 8 gb? Everywhere I check this out the most anyone talks about is 8gb. Any Ideas? I remember the Nextbooks getting some different apps a while back so that stands to reason. I think they switched from the Borders ebookstore to Kobo as well, which is getting switched permanently now anyway. I’ve heard that 16GB cards do indeed work but can’t confirm that myself. I purchased a Next3 back in February, and mine works just fine with a 16GB card. No problems noted yet. Thanks for the input.I finally put a 16GB card in mine and it recognizes all 16GB’s. You’ll have to give more details. Are you trying to download directly to the device or transfer a movie to it? For one, flash video isn’t going to work and other video has to be a specific format and coded a certain way. I setup videos using the same video guide as the Nook Color. Hi, I bought the nextbook next2, I can not install yahoo or facebook, could you let me know how to do it? Also how to copy a movie to the tablet. Can you tell me if I can purchase ebooks from ebay and download them to my nextbook3 What format do i need to look for at ebay. I would not recommend buying ebooks from eBay. They are likely pirated copies being distributed illegally, either that or they are freebies you can get elsewhere for free. You can get ebooks from pretty much anywhere with the Android app for that store—Kobo, Kindle, Nook, etc. Installing Android apps guide. Does the Nextbook support PDF’s, or do I need to convert them to Epub? I have a few e-books in PDF format. I don’t think it comes with a PDF app, but you can install PDF Android apps. Nope. I’ve never had any run ins with Polaroid tablets. my nextbook 3 screen cracked where are good places to get it fixed?